Apple didn’t announce a new iPhone yesterday, so we have to look to Gresso to get our "new iPhone" fix. 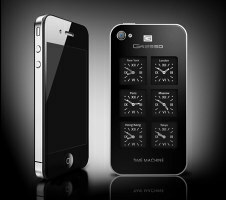 The Gresso iPhone 4 Time Machine features six Swiss mechanical watches on its back and yet is amazingly thin. Gresso are well known for their tenacity to slap mechanical watches onto mobile phones - it matches their sense of classiness, we guess. Their new offering is not a new phone but a modified iPhone 4 called Time Machine (and yes, it has nothing to do with Apple's Time Machine). The usual glass back of this new iPhone 4 is replaced by a mineral glass with diamond coating and houses six independent mechanical Swiss watches, each taking hundreds of man-hours to construct and days on end of accuracy testing. The watches keep the time at the six leading business centers from across the world - New York, London, Paris, Moscow, Hong Kong and Tokyo. 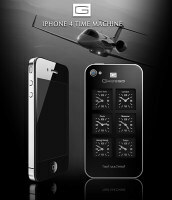 Amazingly, Gresso claim that the iPhone 4 Time Machine is only 1mm thicker than a vanilla iPhone 4 (which measures 9.3mm). Now, either this is some ad-speak that tries to conceal the actual thickness of the device, or Gresso has freed up some room inside the iPhone 4. Or maybe it's just that we don't know anything about making mechanical watches, but 1mm for glass + watch mechanism sounds impossible. Anyway, the Gresso iPhone 4 Time Machine is coming out in 2011 (vague, we know, but you can't rush perfection) and it will set you back $6000. Pricey but you can update it to iOS 5 and use iCloud - that's more than can be said about some of the other Gresso offerings. And if the Time Machine isn't to your liking, maybe you'll find some precious 200-year old African Blackwood more attractive.